At an energetic night-time keel-laying ceremony at Fincantieri, Sir Richard Branson and Tom McAlpin, president and CEO of Virgin Voyages, were lowered down in style from a yard crane in front of a large crowd while over 900 people watched live on Facebook as Virgin laid the keel for the first of its three cruise ships. The ships will be part of the Lady-ship class, according to McAlpin. The first ship will be named via a contest. 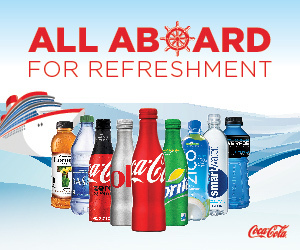 McAlpin talked about a culture of change at the start-up brand, from crew to passengers (the company is calling them sailors) and the vacation experience aboard the company’s trio of 110,000-ton ships. The brand has assembled what it is calling a “Creative Collective” from various design firms to help redefine what people expect from a cruise ship. The funnel was a major part of the exterior design, and flows into the design of the ship, said McAlpin. A first look at Virgin Voyage's external design shows off a futuristic looking prototype ship. The aft of the 2,800-passenger ship will feature a low deck close to the sea with a towering superstrcture in front of it, much like the new MSC Seaside. Virgin, along with shipbuilding partner Fincantieri, also announced the three ships would be extremely environmentally friendly. The ships will have an eventual goal being zero-discharge. McAlpin noted the development of an advanced advanced waste processing system that could also eventually generate energy for the vessel. In addition, Virgin noted the cruise experience would be adults only, with no persons under the age of 18 allowed onboard on the company’s first ship. “We’re designing a cutting-edge, 18-and-over, sanctuary at sea,” McAlpin noted, adding guests would not need to worry about the unpredictability of children aboard. Branson also participated in the traditional coin ceremony, in which a coin is welded to the keel of the ship for good luck. In a statement, Virgin said sailing should feel transformative. 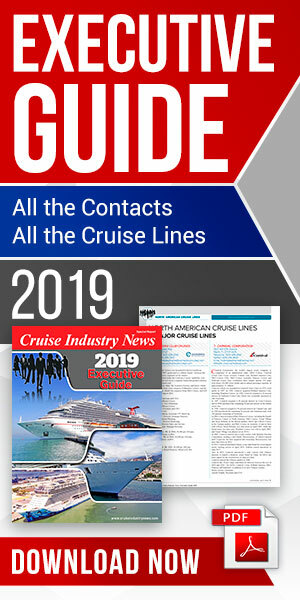 Virgin announced its entry into the cruise industry as Virgin Cruises in 2014, and recently made a major branding adjustment, dropping the word cruises in favor of the word voyages.